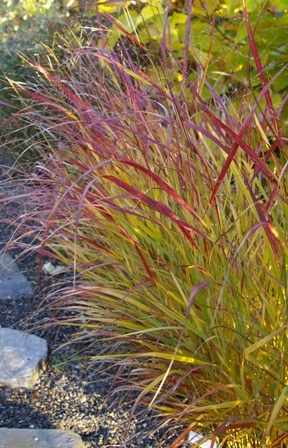 Joy Creek Photo Archive (c) all rights reserved The leaves of Panicum virgatum 'Rotstrahlbusch' turn entirely dark red in the fall, tawny in winter. We combined this with Penstemon 'Mother of Pearl' and Knautia macedonica 'Ruby Star' to draw out the beauty of the tiny, dot-like, red inflorescences. A Great Plant Picks selection.